View More In Swimming Pools. A natural, effective alternative to chlorine and bromine, using organic minerals. Drop into the filter area to enhance water filtration and sanitizing in every cycle. An easy system that allows for use of less sanitizing chemicals. Just place it into the bromine dispenser on the Sundance Spa filter gate. The natural purifying minerals contained in this cartridge controls bacterial and algae growth for up to four months. Note - The SunPurity requires only a small maintenance dose of non-chlorine oxidizer and should not be mixed with Bromine or bromides. 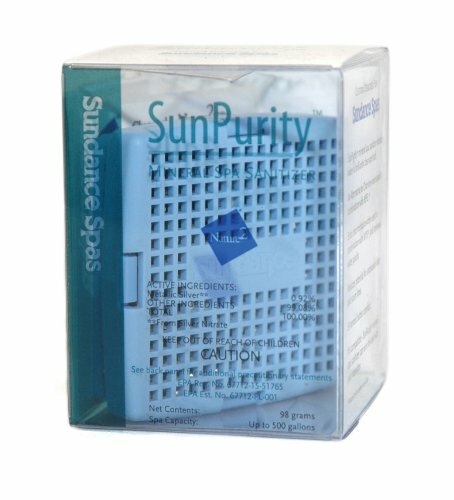 The SunPurity cartridge is not compatible with Biaguanides such as SoftSoak or Baqua. If you have any questions about this product by Sundance, contact us by completing and submitting the form below. If you are looking for a specif part number, please include it with your message. GT Inflatable Pool With Shade for Kids Pool Float Lounge Swimming Outdoor Toddler Air Patio Garden Pool Games & E book by Easy2Find.